We are going places... Who's with us?! Eric Hoffer said, "People will cling to an unsatisfactory way of life, rather then change in order to get something better for fear of getting something worse." What will it take for you to get to the next level? How about letting go of some of the things that you love and value most? Yes, and believe it or not this is the question that often holds people back even those who have achieved some level of success. When you are first starting out in your career it is not much to give up. Why? Because your everything isn't much of anything. But what about when you have a job that you have started to earn some things: good salary, a growing community you are apart of, a level of security, love and respect. Are you willing to give up those things for a chance at doing something that will take you closer to your potential? 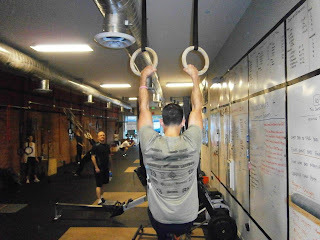 Last week was the last at CrossFit 818. This was another significant tradeoff in my life. It was my second time around being apart of building a CrossFit box from Day 1. I leave with nothing but amazing memories filled with friendships that felt like I have had since childhood, a wealth of experience added, increased confidence in coaching and dealing with more individuals personalities. Is Rambo Cold or Upgrading His Attire? 78% of all New Year's resolutions (i.e. wanna be goals) fail and most people quit their goals after the 3rd week in January. I feel most people think that if they simply write something down for some reason it will 'magically' happen. And if you don't think it will 'magically' happen they sure act like it will because they simply do not do what it takes to achieve the goals they wrote down. This post is intended to lead, teach and inspire you to be the 22% that not only achieves their goals this year but becomes super achievers and figures out how to achieve anything and everything they want in their lives. For some reason we human beings work well in 3's. For you to achieve this year's goals you will need to follow the 3 BIG steps with 3 key behaviors to make it happen. When I see people want the same goals year after year and never succeed at them but continue to say and do the same things over and over again with the same no results... Are they insane? How many people do you know that go on a diet lose weight, but then gain all the weight back? How about the start up businesses that everyone tries (more than once) but very few succeed at? For us to change our lives and really achieve our goals we must become different people. We must stop being the same old person we have always been and become a new and improved version of ourselves. One of my BIG goals this year is to become religious about keeping a journal daily. I often use this saying when I am coaching my FITness classes during a rigorous workout. We can focus on many things or a few things. We can focus on bad or negative things. Or we can focus on great things we are going to do or who we are going to become. The choice is completely up to you. But which direction you decide will lead you down the path your life will take. The ability to manage your focus is one of your greatest powers. What you put your attention on determines what you accomplish, how you feel, and what you will handle in life. You could say it has the biggest influence what can happen to you in life. "I can't do a pull-up." "I have no time." "I can't afford it." "I don't mean to be negative." "I'm not trying to make EXCUSES." If I hear that type of language from that person consistently I feel I have a pretty good idea where they are headed for their future, and it's not good.